With all the talk about 4K for years, it is finally here. Like here here. This advancement has hit the mainstream and is now the new standard. Just look at this year’s CES, the world’s grandest annual tech show. 4K TVs dominated the show, as it has the past few years now. Netflix is pushing all its new programming in the 4K format, with Amazon Video and its Fire TV being the first media streamer to handle 4K. Sky Q in the UK brings 4K to TV viewers. And now gaming is providing 4K enjoyment through consoles PS4 Pro and Xbox One S. The latest to join the 4K circle is Apple with Apple TV 4K. Sales of 4K TVs are climbing as prices drop and they become more affordable. But just as the 4K festivities are getting started, guess who wants to crash the party—Mr. 8K! Will this uninvited guest steal the spotlight from 4K? Let’s find out! But first, some 411 on 4K. 4K is a resolution of 3840 x 2160 pixels, which is four times the pixels found in your Full HD 1080p TV. With about 8.3 million pixels crammed into a TV, this means higher pixel density resulting in a clearer, more defined picture. We’re not talking about sharpness, but allowing you to see more detail and texture. 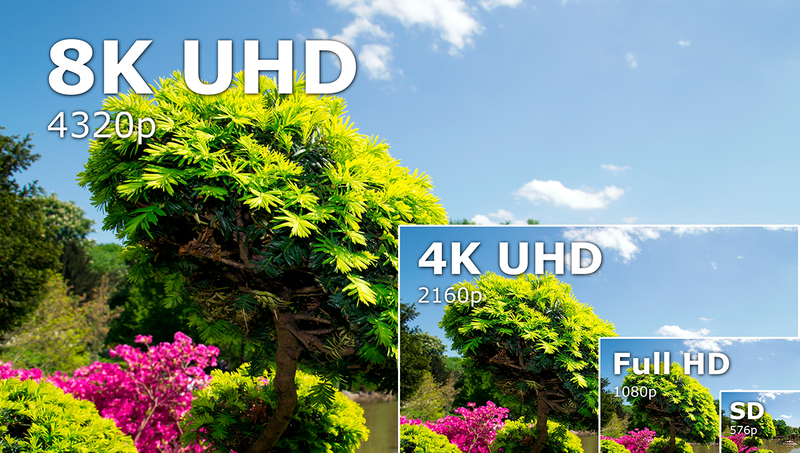 While “4K” is the more commonly used term, you may have heard of Ultra HD, or UHD. These two terms have become interchangeable, but there is a difference, technically. True 4K refers to a resolution of 4096 x 2160, which was first introduced in digital cinemas. UHD, on the other hand, refers to 3840 x 2160 resolution, which is in the TVs you buy for your homes. What is 8K and Who Invited Him? So how much more is 8K resolution? Just like how 4K has four times the pixels of 1080p, 8K has four times the pixels of 4K. While 4K has a resolution of 3840 x 2160 pixels, 8K is at 7680 x 4320 pixels; totaling a ludicrous 33.2 million pixels! That’s a massive bump in clarity and detail. Samsung will be releasing the first consumer-level 8K TV this fall; their 85-inch Q900 QLED TV. Preorders can be made now for a measly $15,000. But I just bought a new 4K TV, you say. Will 4K soon be obsolete?, you wonder. Well, I’m here to tell you to relax, grab some popcorn, and turn up your 4K TV because it is not going anywhere anytime soon. 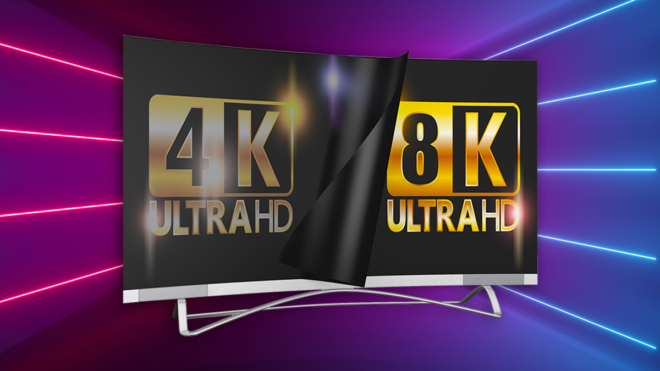 You will be able to enjoy your 4K TV for years to come as 8K still has a ways to go. Although Samsung is coming out with an 8K TV soon, most other 8K displays are mainly aimed at businesses rather than consumers. And they’re not even being released in North America. It’s projected that 400,000 8K TVs will ship in 2018, almost entirely in China. What and How Can I Watch in 8K? Another hurdle for 8K becoming the life of the party is the lack of 8K content available. There really is no 8K content as no one is offering it with no displays capable of projecting 8K. So what you will have is lower-resolution content being upscaled to 8K. In addition to the lack of 8K content, is the requirement to have 8K-compatible devices and cables. There’s a new HDMI 2.1 standard that supports 8K resolution up to 60 frames per second, requiring three times the bandwidth of 4K-capable HDMI 2.0. This means your current game system, media streamer, and Blu-ray player will all max out at 4K if you were to hook them up to an 8K TV. You will need devices equipped with HDMI 2.1 so they can process an 8K signal and output it to an 8K TV. Unfortunately, such devices do not yet exist. Rest assured, there is absolutely no need to worry about your 4K TV becoming extinct. 4K TVs are the best the market has to offer to consumers, and will be for the foreseeable future. With 4K TVs becoming more common and affordable, there’s no better time to upgrade your home entertainment system than right now. The popcorn ready?